To Høegh Silverstar on the "Ships starting with H" page. Scanned from Leif Høegh & Co.'s fleet list, and used here with the company's permission. The above picture was very kindly sent to me by Historical Department, MAN B&W Diesel, Copenhagen. The Australian War Memorial has another picture of this ship, taken at Port Moresby on Dec. 30-1941 (both links are external). It'll be noticed, when going to Page 3 of the archive documents, that this port is not mentioned for this period. Manager: Leif Høegh & Co. A/S, Oslo. Tonnage: 5415 gt, 3261 net, 9275 tdwt. Dimensions: 442' x 58' 5". Machinery: 8 cyl. two stroke cycle double acting oil engine by the shipbuilders. 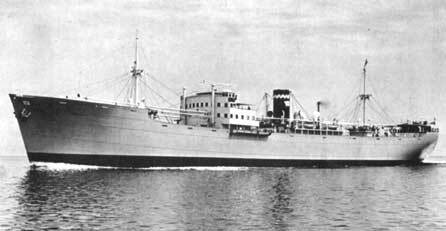 General cargo vessel completed by Burmeister & Wain, Copenhagen in Jan.-1938. According to R. W. Jordan, she was managed during the war by S & J Thompson Ltd., London, managers of Silver Line Ltd., which had a joint service arrangement with Leif Høegh before the war. Captain of this ship in 1941 was Edgar Waaler (age 46), later of Høegh Silverdawn fame (see my page Norwegian victims of Michel). Captain Alf Slaatten took over from him early in 1942. *Page 3 gives arrival Jan. 1. Dec. 22 New York City Gitmo Dec. 29 NG 331 For Cristobal. *Note that Høegh Silverstar is included, with a note saying "Joined 12 Oct. from Cochin", in Convoy BM 70 (external link, info based on Arnold Hague's database), which originated in Bombay on Oct. 9-1943 and arrived Colombo on the 14th. (The Norwegian Fenris is also listed). Nov. 7 Port Said New York City Dec. 5 GUS 21 Port Said to USA. Jan. 14 Hampton Roads Port Said Febr. 10 UGS 30 For Port Said. Apr. 14 Port Said New York City May 11 GUS 37 Port Said to USA. Sept. 22 Port Said New York City Oct. 17 GUS 53 Port Said to USA. Apr. 17 Passed Gibraltar Port Said  Independent Page 5 gives arrival Apr. 25 (on to Suez same day). For information on voyages made in between those discussed below, please see the documents received from the Norwegian archives and A. Hague's Voyage Record above. When war broke out in Norway on Apr. 9-1940, Høegh Silverstar was in Colombo, having arrived there that same day from Singapore, according to Page 1 of the archive documents. Her 1941 voyages start on Page 2 (unfortunately, the document is torn, so that some of the departure dates are gone) and continue on Page 3, which also shows her 1942 voyages. As will be seen, she appears to have spent almost a month at Sandheads (or Calcutta) at the beginning of 1942, having arrived there from Sydney, N.S.W. on Febr. 20; departure is given as March 17. She also spent over a month in New York that spring. She had arrived from Table Bay (or Cape Town) on May 5 and did not leave again until June 12, arriving Table Bay July 7. From there, she proceeded to Bombay on July 12, with arrival July 28, departing for Cochin on Sept. 12. Later that year, another month was spent in New York, where she had arrived from Guantanamo Bay on Nov. 23, heading back to Guantanamo Bay on Dec. 22. Similar long stays are shown on Page 4. 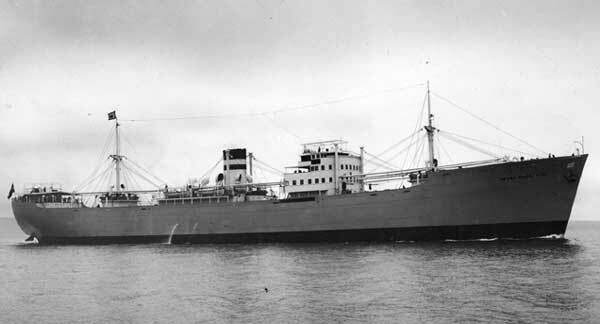 Skipping now to 1944, when she was in Convoy UGS 30, which was attacked by German aircraft off Oran on Febr. 1. This convoy had departed Hampton Roads on Jan. 14 and arrived Port Said Febr. 10 (available via the external link provided within the Voyage Record; the Norwegian Gausdal is also listed). According to "Nortraships Flåte", 40 bombers approached but British aircraft split the formation so that only 7 reached the convoy. 2 aircraft attacked at 18:50 ship's time, right after the convoy's escorts had returned to base (North Africa?). One of the ships (in station No. 11) was hit by a torpedo and damaged by the explosion, but was able to continue. I've been told this was the American Richmond P. Hobson. The other aircraft torpedoed a ship on the other side of the convoy (no details on damages, possibly sunk? This must have been the American Edward Bates listed as sunk by aircraft on Febr. 1 in Arnold Hague's "The Allied Convoy System", with the loss of 1 man). The aircraft later returned to drop some bombs, but no hits were achieved. The voyage could then continue via the Suez Canal, Red Sea to Karachi and Bombay. Høegh Silverstar was in station 21, and had been to New York - she arrived Karachi on Febr. 21, Bombay Febr. 26. Again, see Page 4. She's also listed among the ships in Convoy UGS 45 from Hampton Roads in June-1944; follow the link for more info. German bombers, stationed in the south of France, posed a more serious threat to allied shipping in the Mediterranean than the U-boats did at this time, their primary goal being the large UGS convoys from the U.S. carrying supplies to the allied forces in Italy. On the other hand, the convoys' anti aircraft defence system was very strong, with aircraft patrolling night and day. Additionally, the merchant ships' own armament played a part in the defence, as did the squadrons stationed in North Africa and the special anti aircraft cruisers that often joined the escorts from Gibraltar, as well as the radar installations in the escorts which could detect the aircraft early and thereby give the convoys time to prepare for attack. Her 1945 voyages and some 1946 voyages are listed on Page 5; see also Page 6. Sold in Aug.-1954 to Rederi A/B Asta (Arthur Andersson, manager), Finland and renamed Alca. Transferred in 1956 to the management of Lennart Karlsson. Collided on Febr. 12-1963 in the River Scheldt with the Swedish M/S Alvafors, while outward bound from Antwerp for Jacksonville. Beached on fire and broke in two the next day. Back to Høegh Silverstar on the "Ships starting with H" page. The text on this page was compiled with the help of: "Nortraships flåte", J. R. Hegland, and misc. - ref. My sources.